Over recent years, the Spanish real estate sector has managed to emerge from a deep crisis and regain remarkable strength. 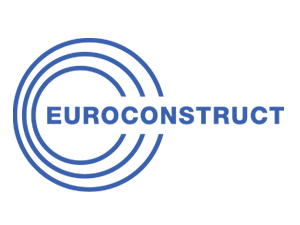 Needless to say, this is excellent news for the Spanish construction sector, since it proves that there is a sizeable demand among investors for both residential and non-residential assets without which the start of new projects would hardly be possible. One might conclude that the rapport between real estate and construction looks as good as it can get, but somehow there are clues that the romance may be wearing out up to the point where the relationship is getting toxic. The most distressing warning sign is the disparity between the performance of real estate and construction. If we look at the behaviour over the last ten years, we see how construction (grey line on the graph, only building activity without civil engineering) is still a shadow of what it used to be, and how the last three years of growth around 7% p.a. are hardly noticeable if we use 2008 as a reference point. Real estate is a totally different story: it recovered in 2014 the volume of transactions of 2008, which is by itself a remarkable feat. At that moment it was not clear what was going to happen afterwards; after all, the market conditions were pretty unusual (pent-up demand, prices still low, higher return expectations than in other sectors, plenty of liquidity) and it could have ended in a one-off spike. But investors were hungry for more and the market did grow an extra 60% (red line in the graph) and has been able to keep this level during the last four years. The figures that include the corporate operations with a real estate component (blue line in the graph) break the 2015-2017 ceiling and reach a new record volume in 2018. Accordingly, Spanish media have been reporting during the last four, maybe five years the news of success in the real estate sector. The general public do not have a very clear perception of where the limits are (if any) between construction and real estate, so they tend to believe that if real estate is booming, construction must be booming too. In fact, the average citizen may have received signals about construction emerging from its lethargy that do look coherent with a thriving market: housing permits growing at double digit rate, construction companies struggling to find workers, or strong confidence indexes that do not reflect the kind of scepticism that is already permeating other economic sectors. Any insider knows that that collection of positive indicators is perfectly compatible with a still depressed construction sector and understands also how real estate can thrive for a while without the contribution of the construction sector. The explanation can be found in the sheer dimension of the previous construction cycle, when Spain produced large amounts of new building surface (creating surplus stocks for the years to come) and afterwards production virtually stopped (reaching a bottom so deep that even the most modest increase in production was enough to trigger large growth rates). 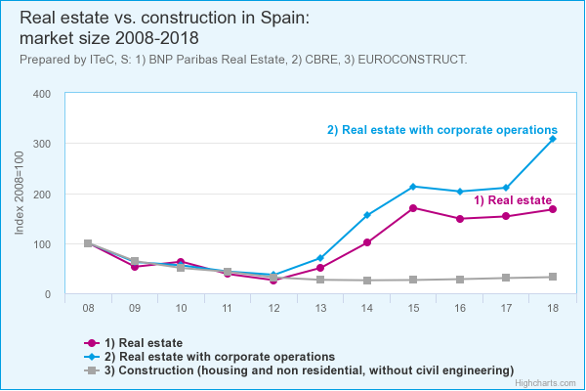 But those points are difficult to be perceived by the average citizen, who just assumes that the Spanish construction sector must be living a second golden age. And this leads to two conclusions: 1) another building bubble is inflating, and 2) it will pop sooner rather than later. This may sound a bit hypochondriacal when seen from a foreign point of view, but it is the reflection of some dynamics that have been present in Spain since the crisis. Spanish construction has acquired a reputation of weakness, so in the public eye it is a sector that can collapse with an ease that is unthinkable in almost any other branch of the economy. On top of that, many institutions and persons with an aura of authority (deserved or otherwise) have insisted on the idea that construction has been responsible for all the economic woes of the country or, in fewer words, that “construction is evil”. As a result, the general public in Spain do not only expect the building market to fall; they also believe that the building market deserves such a fall. Refuting these views is hard work. To begin with, we have the precedents of the last decade, when too many analysts made an epic mistake judging that there was enough demand for all that building production, housing included. So, when somebody assures us now that there are no reasons to worry, it automatically triggers a wave of mistrust, no matter how reliable is the data that backs that conclusion. Obviously, we must distinguish between the mistrust that travels through the social networks and the mistrust that may or may not be influencing investment decisions, either at family level or at corporate level. So far, neither sales nor project portfolios seem unaffected by this background noise, but we must do not underestimate it. Particularly now that the distance between social posts and real-world policies seems to be shrinking at an alarming pace. Refuting the bubble goes against the social tide, and that can be reason enough to deny it only half-heartedly. This is where a compromise solution has appeared, one that seems to satisfy both the analysts’ need for technical rigour and the people’s thirst for blood, neatly encapsulated in a handy catchphrase: “There is not a production bubble, just a price bubble.” The statement about production part is beyond dispute (again, the grey line of the graph). Regarding prices, we have witnessed a sharp increase in the prime markets, while the rest are recovering at a much slower pace. The prospects of a drop in price, even in the most inflationary niches, seem rather weak; among other things, because absorption surpasses production. Qualifying this as “bubble” may be a bit of an overstatement, but it serves well the purpose of admitting that the market is getting more vulnerable. We are free to decide what to make of this hypothesis of “just a price bubble”: we can take it at face value and brace ourselves for a severe price correction or take it as a warning about prices flattening out. In any case, identifying prices as the main risk is a way to point the finger at the real estate market as the main suspect for the next shock. This time, construction could be more the victim than the villain. Regrettably, not so many will care.